Shannon Judge grew up trying to distance herself from her Indigenous identity, but all that changed when she became a mother. Judge was born in Parry Sound, Ont., a town next her Wasauksing First Nation reserve. She was raised by an Ojibwe mother and an Irish father. Judge and her mother would split their time between living on the reserve and in Parry Sound until the age of seven when her father died. She was raised in Barrie and moved to Toronto to attend college at 20, and has lived in the city since. Judge said she moved to Toronto because of the anonymity she felt in the city. She wanted to distance herself from her Indigenous identity because of the discrimination she faced. “As an Aboriginal person, no matter where you are, you’re constantly having to defend not only your native-ness or your Indian-ness, you’re having to defend the political actions of the government,” said Judge. Judge’s mother was a first-language Ojibwe speaker, but doesn’t recall much of the language anymore. Her mother attended a school at Wasauksing where she was forced to speak only English. “Although they were first-language Ojibwe speakers, they aren’t now,” said Judge. 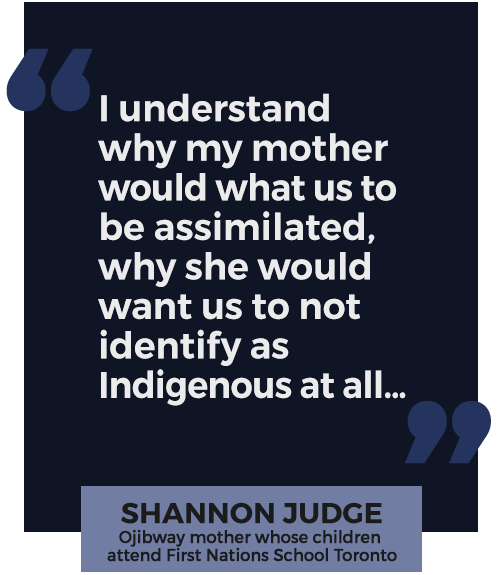 Judge didn’t grow up learning about Indigenous cultural practices, and felt uncomfortable with her Indigenous heritage, a trait her daughter didn’t inherit. It was only after Judge entered motherhood that she found herself wanting to connect with her Indigenous culture, and for her children Raven, 9, and Rayne, 7, to grow up learning about the history of Indigenous people in Canada. That’s why she enrolled them in Toronto’s First Nations school, which was founded in the 1970s as Wandering Spirit Survival School. “When my kids started going to [the First Nations school] we started participating more, and learning more, and more open to it, which kind of surprised me because I didn’t think that was going to happen and now we’re much more involved. So, we do participate in more cultural things and more political things, like being on the parent council at the school,” said Judge. Indigenous people are the original settlers of Canadian land, and have a diverse history that begins long before the arrival of European colonizers. Beginning in the 1870s the Canadian government, along with different religious organizations, established the Indian residential school system. The residential school system was meant to isolate children from their families and force them to assimilate into non-Indigenous culture. At least 150,000 Indigenous children went through a residential school system, according to the government of Canada website. The last residential school closed in 1996. Dr. Ingrid Sochting, a clinical psychologist at the University of British Columbia, has been working with residential school survivors over the past 25 years and says it isn’t uncommon for Indigenous peoples to want to learn about their past after entering parenthood. “Across peoples and nations, it is not uncommon that as children become parents themselves they develop a new curiosity in their heritage,” she said. According to Dr. Sochting, as more times passes events become further in the past and the distance makes it feel safer to talk about. “It often does take the third-generation, or grandchildren, to begin to ask questions and for people to feel that sufficient time has past for it to be safer to engage in the conversation,” she said. Governed by the Toronto District School Board, the First Nations school’s curriculum is interwoven with Indigenous cultural teachings and history lessons. However, Judge received resistance for her decision from some members of her family, including her mother. They told her the school was less in some way, but Judge said it was more important to her that her children grow up to know true Canadian history, and not the one she learned while in school. As a parent, she says understands why her mother would want the family to assimilate into the dominant culture, but thinks her children are better off being informed. Her children have been a gateway to reconnect with her past, says Judge. Their curiosity about their Indigenous heritage and what they learn in school are reasons conversations about their culture flourish at home.